The above link goes to a special 2-disc collector's edition set of the film. Van Helsing (2004): This is definitely a superhero movie and seems to be along the same order as "The League of Extraordinary Gentlemen"...taking popular characters from classic fiction and turning them into superheroes and supervillains. Heck, Richard Roxburgh...who plays the main villain Dracula...played the main villain Professor Moriarty in "The League." If you're familiar with the character of Van Helsing from the book "Dracula" and the classic "Dracula" movies, you'll know that he was always much older. In this movie, Van Helsing was made to look younger and a lot hipper. He looks like Stevie Ray Vaughan! Blues music fans will know who I'm talking about. 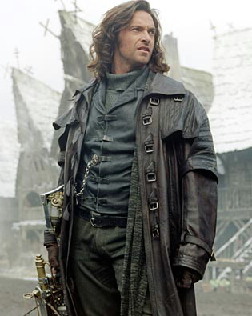 Hugh Jackman is great as Van Helsing! Very believable and a legitimate action star! He had to get quite physical to play this role and it pays off. He fights vampires and wolfmen. Frankenstein's monster becomes his ally. At one point in the film, Van Helsing becomes a wolfman in order to kill Dracula (he gets better). The only thing I don't like about this film is the end. Kate Beckinsale's character, the leading lady in the film, gets killed! What the heck! Throughout the entire picture she gets beat up, thrown around, banged up against trees and buildings, etc. Then Van Helsing as a wolfman kills her. How? I'm not sure. He doesn't scratch her and it doesn't look like he strangles her or anything. We see him standing over the gypsy princess, next thing we know we see the heroine's face and she's dead...eyes wide open. Did she die from shock? That still bugs me because I don't think they needed to kill her off to serve the story. Ignoring the fact that Kate Beckinsale's character gets killed, you SHOULD watch this movie. It's quite clever and I enjoy how these classic characters are inventively casted together in an exciting action story. 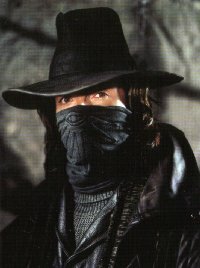 Van Helsing also has a goofy monk sidekick who invents weapons for him, and the gadgets he uses are very "James Bond." Very interesting.